Well we have been so busy this week that we have missed some of the good solar system observing opportunities, like the large gas giants, and Mars, and a total lunar eclipse. Hope the rest of you are doing a little better. So to make up for that, let's stay inside and do more astrophysics! Our first topic follows up on previous posts on the nature of cosmic rays. 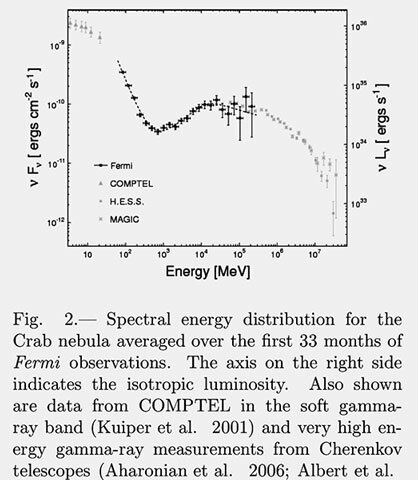 We have discussed how cosmic rays are detected on the ground and want to examine more closely now the detection of Cherenkov radiation with optical based telescope can determine the spectra of incoming cosmic rays and in this one special case, the spectra for cosmic rays from the Crab Nebula (M1). In review of the scientific literature one of the first topics one needs to come up to speed on is how the spectra is presented in a graph and what the units on the axes means. Check out the chart below and notice the vertical axis is in units of ergs per square cm and per second and the horizontal axis is in units of MeV. Ok, so we expected some kind of number of events or amplitude on the vertical axis, so let's see how we can get something like that. If we pick some arbitrary point like 10^-10 on the vertical axis and 10^4 on the horizontal axis we can begin to see that the point on the curve tells us how many ergs of energy are received per second per squared cm when the incoming particles have energy of 10,000 MeV. Hey, so if we convert MeV to ergs we can compare that point on the curve in the same energy units and get the total flux for particles in that energy range. So using the conversion factor of 1 MeV = 1.602 x 10^-6, we get that the number of 10,000 MeV particles received would be 10^-10 * 10000 * 1.6 * 10^-6 = 1.6 * 10^-12 particles per square cm per second. Wow, that is a really small number of particles, so let's make another couple of assumptions and say that our telescope has an aperture of one square meter and we assume we want all of the particles up to say 10^8 MeV and just say the spectra averages out to about 10^-10, then the number of particles of all energies received by our telescope, without repeating the calculation here, will be 1.6 Cherenkov photons per second. Hey, that number is better, but it is still going to take a long time to collect enough data to get good statistics. 1 remember from one of our earlier posts that the background cosmic ray flux at the Earth's surface is about 250 particles per second per square meter. So we have to be careful or our 1.6 photons per second from the source, like the Crab Nebula, will be swamped out by the background noise. But, we see that all is not lost. Assume that the image of the target just falls on one pixel, of say one square centimeter, out of 10,000 that make up that whole one square meter of telescope aperture. So each second, we will collect 1.6 photons on that pixel due to the source and 250 more noise photons will be arranged on the rest of the one square meter. So after 100 seconds, that one pixel will have 160 counts due to the source and the noise of 25000 counts will be distributed randomly between the other 10,000 pixels, so only about 2.5 counts due to noise gets added to our signal. Now, given the contrived assumptions used in this example, we can get a sense of how we can make astronomical observations with a Cherenkov telescope. Even though the Crab Nebula is one of the brightest gamma ray sources in the sky, the number of Cherenkov photons that reach us here is very, very small. There are a lot of other technical questions about how the number of emitted gamma ray photons from the astrophysical source is related to the number of Cherekov photons received from the resulting air shower caused by this primary gamma ray coming to Earth and interacting with molecules in the upper atmosphere. But these and other questions will have to wait till later. 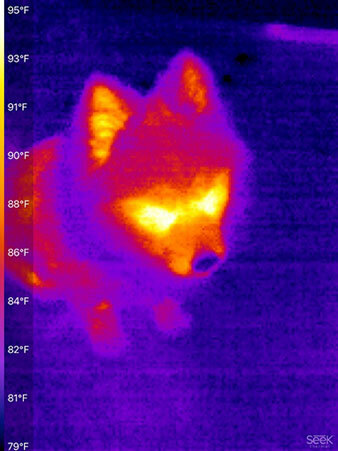 For the next topic, let's return to the trial usage of the Seek Thermal infrared camera. The previous images were not focused very well and one reader, Science Nerd and Theatre Impresario, Scott, recommended trying out the camera on some object that had well defined and sharp edges, like a kitchen fork. Wow, I tried it out with a fork and then discovered that the camera focus adjustment knob worked ok, but had to be set to the far end of its adjustment range to get a much better focus. Check out the image of Astronomer Assistant Danny below. That looks much better and you can see the temperature scale and even Danny's cold nose. Thanks for the suggestion, Scott! Well with the camera focus adjustment now better under my control, I moved on to another test subject. 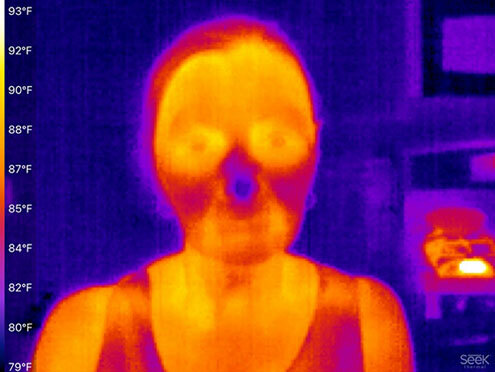 This image is of Resident Astronomer Peggy, without the third eye as seen previously, but also with a cold nose too! 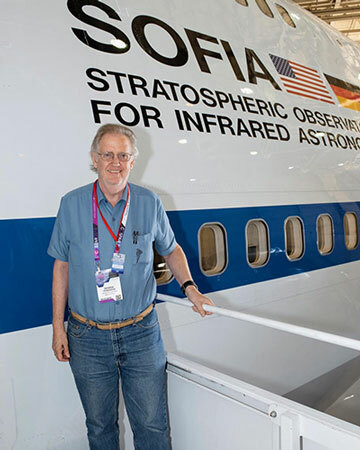 Ok, now that we have some astrophysics out of the way and have got the latest IR pictures out of the way, we can finally get to some of the official pictures from NASA photographers who accompanied us on our COSPAR sponsored tour of SOFIA at the Armstrong Flight Research Center in Palmdale. The first photo shows the Resident Astronomer standing at the entry door to SOFIA and getting ready for the tour. This next photo is looking aft toward the rear pressure bulkhead (white) beyond which is the actual 1.5 meter telescope mirror. The telescope mirror is located in the unpressurized section of the aircraft and all of the secondary optics brings the images back into the crew area and instrumentation area, which is in the pressurized cabin. 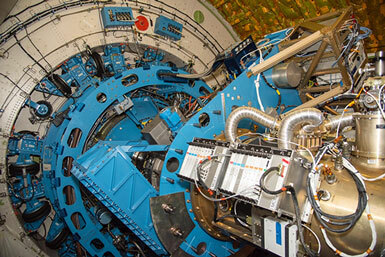 Everything in the foreground (blue) is part of the telescope assembly that moves independently, within +/- 3 degrees, of the aircraft motion. 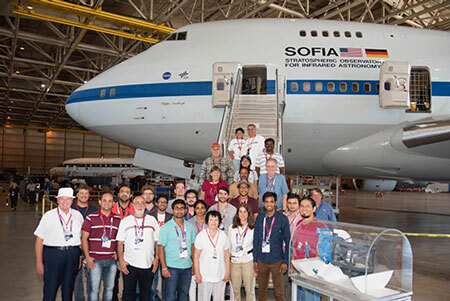 SOFIA personnel told us that during flight operations they can watch the whole assembly move up and down as if it is moving, but in actuality, it is the aircraft that is moving around, due to air turbulence, and the telescope remains in fixed position tracking its target. 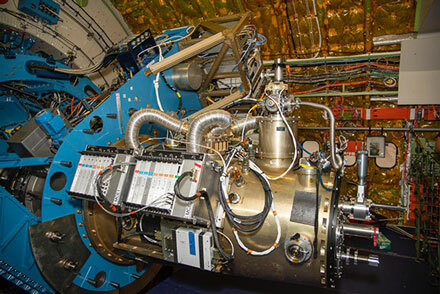 In this photo, you can see in more detail the HAWC+ spectrometer, which is one of the more popular instruments that can be mounted on the telescope assembly. In the background you can see some of the Boeing 747 structural members and lots and lots of cabling and piping. We got to see where the telescope operators sit during an observing session and we also saw all of the banks of computers that control the telescope and store all of the recorded data. We did not get to go up stairs to the pilot area, nor to the where we could actually see the 1.5 meter mirror. That area is maintained closed with slight positive pressure to ensure that dust and moisture do not condense on the mirror or optics. During flight, the side door opens and the telescope can move its viewing angle up above the horizon by something like 40 degrees. If the weather gets too cloudy where moisture might condense, they close the door and stop all observations. We all had a great time and we enjoyed lunch there and all the rest of the NASA guides' hospitality, especially since they all came to work on a Sunday to give us a tour. Especially Randolf for ensuring that our visit requests were valid and Raquel, who got us on the bus, and since we couldn't bring our cell phones with us, she let me make a phone call on her phone for some of my unfinished hotel checkout. Thanks for everything!